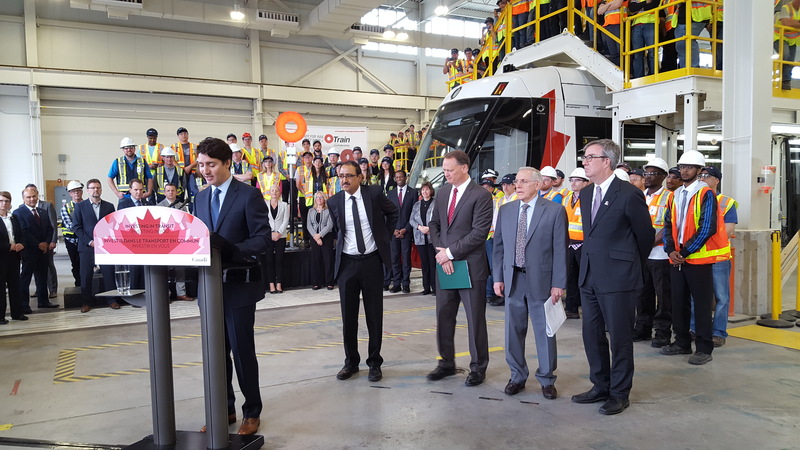 Ottawa – Mayor Jim Watson was pleased to welcome Prime Minister Justin Trudeau to the Belfast Yard Maintenance and Storage Facility today, where the Government of Canada announced its financial support for the Stage 2 LRT project. The federal government has pledged to contribute up to $1.09 billion in total eligible costs to Stage 2 through their long term plan, Investing in Canada. This is in addition to the over $67 million the federal government committed to Stage 2 through the first phase of the Public Transit Infrastructure Fund last year. Mayor Watson and Prime Minister Trudeau were also joined by Infrastructure Minister Bob Chiarelli from the Province of Ontario, which has already promised to invest $1 billion towards Stage 2 LRT, plus 50 per cent of the cost associated with extending the O-Train system to the Ottawa airport and from Place d’Orléans to Trim. The remainder of the LRT costs, approximately $1 billion, will be covered by the City of Ottawa. In the South, the Trillium Line will be expanded to reach Bowesville Station, with a link to the Ottawa Macdonald-Cartier Airport, by 2021. In the East, the Confederation Line will extend to Trim Road by 2022. In the West, it will reach Algonquin College and Moodie Drive by 2023. Once complete, Stage 2 will bring 70 per cent of Ottawa residents within five kilometers of efficient, clean and reliable rail service with the capability of carrying an estimated 24,000 riders per hour per direction during peak periods. The complete O-Train system will span nearly 60 kilometres and include 41 stations. The confirmed federal and provincial funding allows the City to move forward with its innovative procurement solution for the Stage 2 extensions, including issuing the Request for Proposals for the extensions of both the Confederation and Trillium Lines, as well as ordering the additional vehicles required to service the expanded system.